Inner, front and side pockets, cotton webbing grab handle, adjustable straps – Lismore means business. It's great for travel or everyday use, made of hardy, waxed cotton. And the backpack style is perfect for cyclists and commuters. You're busy. We get it. We've got you. Lismore is for busy people. Made from 100% cotton, with a wax finish that makes it water resistant, it's designed to meet the needs of your everyday commute and look good, too. Lismore's shape is unusual – the roll-down outer closure conceals an inner-zip while adding an urban aesthetic. 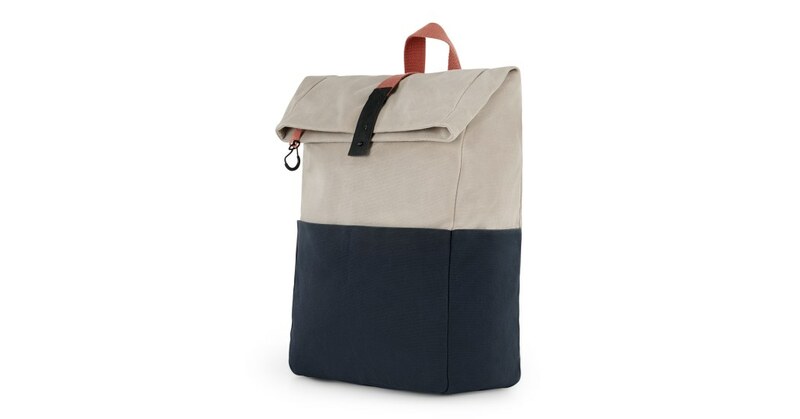 The colour is cool too, in stone and navy with brick coloured straps.